Thomas Schuler is considered to be one of the leading experts of Napoleon in Germany. Degrees in History of the Middle Ages, Contemporary History, Early History and Political Science. A freelance historian since 2003; nationwide lectures, work as a journalist for the FAZ (Frankfurter Allgemeine Zeitung), the Münchener Merkur, the Augsburger Allgemeine Zeitung, as well as for more than 30 other German, Austrian, and Italian newspapers and magazines, dealing with the subject "Napoleon". Television and radio interviews (e.g. WDR ZeitZeichen among others, WDR = West German Radio) for several series about Napoleon, e.g. a TV series "Napoleon and the Germans" on ARTE TV (ARTE = Eurpean Cultural Television Channel). Public guided tours at original locations in Ulm, Donauwörth, Augsburg, Memmingen, Günzburg, Elchingen and Munich. Private tours on the battlefield of Elchingen with the French senator Tizon, with the President of the Pan-European Union Alain Terrenoire, with generals and officers of the German army within the framework of military historical educational training, with the President of the local police force, and with General Sir Richard Shirreff, Deputy Supreme Commander of the Armed Forces of the NATO in Europe. Contract work for the Federal State of Baden-Württemberg, 2005 conception and supervision of the exhibition "200 years Battle of Elchingen". Since the beginning of 2001 work on the multivolume series of books "Napoleon in Bavaria", of which the first volume "The Battle of Elchingen"/"The Liberation of Munich", was published in March 2010. 2010 Press work for the film "Bergblut" ("Mountain Blood"), which won several awards and prizes. Work on the frame programme of the German-French exhibition "Napoleon and Europe: Dream and Trauma" at the exhibition centre in Bonn. 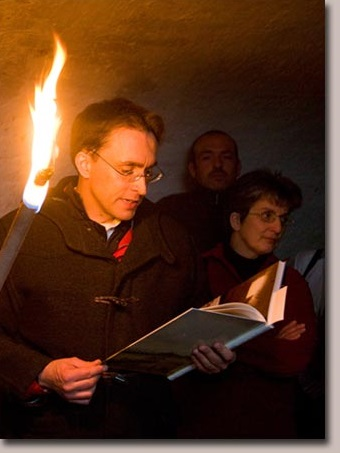 2011/12 Plans, organisation, and performance of historical events with the Prince of Hohenlohe at the Schillingsfürst Castle, and with the Prince of Wrede at Ellingen Castle. 2012 Inaugural lecture at the "Karl Friedrich Schinkel, History and Poetry" exhibition at the State Museums of Berlin. 2013 Contractual object research for the Federal State of Bavaria on behalf of the House of Bavarian History for the coming State Exhibition in 2015. Interview with the 2013 Pultizer Prize winner Tom Reiss, author of book The Black Count. 2014 Planning and organisation of the reception for the Duke of Leuchtenberg, the great-great-great grandson of Empress Josephine, hosted by the Mayor of Ulm, Ivo Grönner. Lecture for the representatives of the energy industry on the subject of "Napoleon and Spain in La Gomera". 2015 Commemorative address with Duke Markus of Hapsburg-Lothringen on the occasion of the dedication of the Austrian Prisoners-of War memorial plaque in the Augsburg Church of the Holy Cross. In the same year, publication of the book Wir sind auf einem Vukan - Napoleon und Bayern (We sit on a Volcano - Napoleon and Bavaria), published by C. H. Beck Publishers. Book launch in the Royal Hall of the Bavarian Court in Munich with the French Consul General Jean-Clade Brunet and the Count of Montegelas aus Rednern. In addition to C. H. Beck Publishers, the book launch was graciously supported by Prince Carl Friedrich von Wrede, as well as by the Palm-Stiftung in Schorndorf, represented by Director Ms. Annette Krönert.